Just received my 32cm Copper Frying Pan, and am certainly not disappointed! I expected quality, but am blown away by my beautiful pan! It will become a treasured and essential part of my cooking equipment. I've given this pan 5 stars, I only wish I could give it 10! First Class Service from beginning to end. Superb product and customer service. Extremely high quality and exceptionally well made. Highly recommended! Before having this pan, I always struggled to cook a breakfast for my family without involving two or three smaller pans simultaneously. With the purchase of this super pan I do not have such issue anymore as I can easily have 6-7 eggs fried on it at the same time, or having 3-4 eggs and a bunch of sausages. Love it - great for steaks as well as heats up very quickly and seals the meat perfectly. A bit pricey but a great purchase. 531 customers found this review helpful. Did you? Yes, I did! A complete joy to use especially for the Sunday morning fry up ! This pan is not for the feeble cook. Weighing in the heavy weight corner of my pans, one can guarantee the heat will be evenly distributed throughout the whole of the cooking area, which is certainly what I have found on my Smeg gas cooker. Fantastic for searing or cooking a large family Bolognese sauces, but as I said before, perfect for a Sunday fry up! 616 customers found this review helpful. Did you? Yes, I did! I have just received this mega frying pan and am dying to use it but can't until Christmas as it is my present. I have seen and held the pan and lid though, as i was in when it was delivered. They are both very well made and look very professional although they are a bit on the heavy side but i like this as it gives a great feel to the pan and ensures my partner doesn't use it as it is to heavy for her. I was watching Jamie Oliver's Christmas show on the TV the other day and would you believe it he was using Falk pans. He uses all sorts of pans, plates etc. just as long as they are the best pot or pan for the job so he must rate Falk Pans highly. I will give an update on the pan after Christmas day. 704 customers found this review helpful. Did you? Yes, I did! 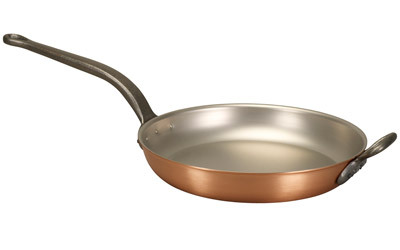 I was attracted to this large copper frying pan as it was on special offer. The heat distribution is exactly as advertised - superb! You can cook a whole fried breakfast for two in this, and I have also used it to cook paella in. It cleans up very easily after use and looks great. 615 customers found this review helpful. Did you? Yes, I did! 466 customers found this review helpful. Did you? Yes, I did! I was a bit worried paying such a huge amount for a pan, but I have to say it is just awesome. The trick of making it non stick by heating some cooking oil and then wiping it with a paper towel did work! ( I was a bit skeptical) I wanted a big pan to do most things including frying fish - which where I live can get quite big! This will take anything I will eat on my own and even for 2. It does take a degree of skill to use it well and I am still working on that. But the website has lots of good advice on dos and donts. Probably the biggest worry is burning stuff as it gets hot really fast (and that will screw up the non stick big time!!!). In sum it is a real joy to use. I arrived here some 6000 miles East of UK really quickly - that was a very nice surprise. Although this pan is heavy it's extra handle make it safe and easy to pick up! It's a perfect size for cooking for the whole family ( sometimes there are 7 of us). It's size also seems to make the heat transfer very good. And was easy to cook meat evenly. Definitely worth the investment! 603 customers found this review helpful. Did you? Yes, I did! I have used the 32cm frying pan quite a few times since I got it, and it’s fantastic bit of kit! It’s a real behemoth and is ideally sized for large dishes. With a frying pan this big you really do need the very best thermal conductivity to ensure that the pan heats evenly, and this pan achieves this superbly. I use it a lot for large paellas where it works a treat—far better than any of the paella pans you can buy which are thin steel and designed for the well-spread heat of charcoal cooking (like a bbq), not the oven-top. (I noticed another review mentioned cooking paella in it also, but any large recipe will come out great). If you’re looking for a large(!) frying pan, look no further. Would highly recommend. 750 customers found this review helpful. Did you? Yes, I did!